Cheri Lucette is a self-proclaimed “little girl with a harp,” and she is pretty accurate in this self-assessment. Yes, she is little. And yes, she does have a harp. But when listeners hear her play the complex string instrument that stands close to as tall as she does, the focal point is not her size but the jaw-dropping, beautiful, hymnal music she produces. Set to meet Lucette on the upper deck of North Station where the Cambridge-bound Green Line rolls through, I was pleasantly surprised to already hear the sound of her harp resonating throughout the station as I climbed the stairs from the inbound Orange Line train. She sat relatively in the middle of the space, with her back against a pillar. Her wooden harp sat gently in front of her with red, white and blue strings. The beauty of her angelic voice combined with the gentle, elegant plucks of her harp strings created a stark contrast of beauty against the stained walls of North Station. As her song came to an end, I introduced myself and expressed how, after listening to her so many times during my commute and on Boylston Street during summer nights, it was truly a delight to have the chance to sit down with her and talk about her experiences as a busker. She responded humbly with a slight grin and a thank you. She packed up her things—her set up proved to be incredibly portable. A fold-up stool. A small pouch used as a tip jar. Her CDs and contact information. Everything meticulously fit into her small bag. Even her harp fit into a bag that she could throw over her shoulder and carry around with relative ease. We headed up the escalator to grab a slice of pizza in the Commuter Rail section of North Station. “This is where I come on my breaks,” she told me. We sat on a bench in the station with a few other commuters, some patiently and some anxiously awaiting their trains. The space seemed empty without music. She began to tell her story, and it seemed like fate that she became a busker. One customer improvised. He put a dollar into her coffee cup. Her cup that was still half full of hot coffee. By the end of the day she had 15 to 20 dollars soaked in coffee. She has been playing since age 9 and learned from Catherine Elliot, a direct student of Marcel Tournier at the Paris Conservatory of Music. Her first time busking was in Ithaca, NY, and it was completely coincidental. Lucette had always been private about her ability to play harp. Not too many people knew about her talent. She kept quiet about it—she’s a quiet person. As she played one day in her Ithaca apartment on her full-sized pedal harp, she had a gut feeling. She needed to open up her windows and door for everyone to hear her playing. So she did. The following day she received a phone call from a friend asking if she would like to store her harp at the café she owned, as it physically took up half of her apartment. She lugged it over there and practiced in the café from time to time, much to the delight of those sipping coffee and tea and nibbling on sandwiches. She rarely received compensation, but to her it was space to practice comfortably. And that’s what she needed. She had never practiced in front of people before, so she was admittedly nervous to start. Then out of the blue, her friend’s café closed down. “It was kind of a hippy run place,” Lucette claimed with a smile. “I don’t think they really paid rent.” With her practice space no longer available, she contacted another friend at a different café across town who agreed to let her store the harp there. As she transported it from point A to point B, she decided to stop about halfway and practice outdoors, something she had never done before. People stopped to listen. A lot of people. They wanted to tip her, but she was just practicing, so she didn’t have a tip jar. Listeners kept asking, “Where’s your bucket?” Some even seemed angry they couldn’t leave her some money. One customer improvised. He put a dollar into her coffee cup. Her cup that was still half full of hot coffee. By the end of the day she had 15 to 20 dollars soaked in coffee. After Lucette finished her slice of pizza, we headed over to the Equal Exchange Café, where Lucette used to serve up coffee and espresso a few months ago before transitioning to playing full-time in the subway. Upon walking in, she was greeted by everyone working there with smiles and a hug from her former boss – a testament to how likeable she is as a person away from her harp. As we approached the counter, a man took our order and made small talk with Lucette. She asked him, with a bit of fun-loving peer pressure behind her question, “Have you been down there to play yet?” He responded in the negative, with a bit of hesitation, seemingly signaling his nerves were holding him back. Listening to her jokingly pester one of her former co-workers to head down to the T and play some songs on his guitar truly shed light on the underlying gumption of Lucette as a musician. She is a small girl with a big harp. She is a woman street musician playing original songs in subway stations. It is such a unique and elegant talent to have and simply so rare to see in the subway that it undoubtedly raises the intrigue for commuters, making them stop and listen as she plucks away. As she played, words started popping into her head. Ideas started taking over. Themes of catharsis began filling her head. Sentences formed. Lucette is a full-time busker. When we talked, she was on a two week “residency” at North Station playing about eight hours a day, six days a week, typically taking Sunday off. The T is actually where the whole creative process happens for her. Everything about her music is created in the subway. Composing music, writing lyrics and practicing these new songs. Everything. 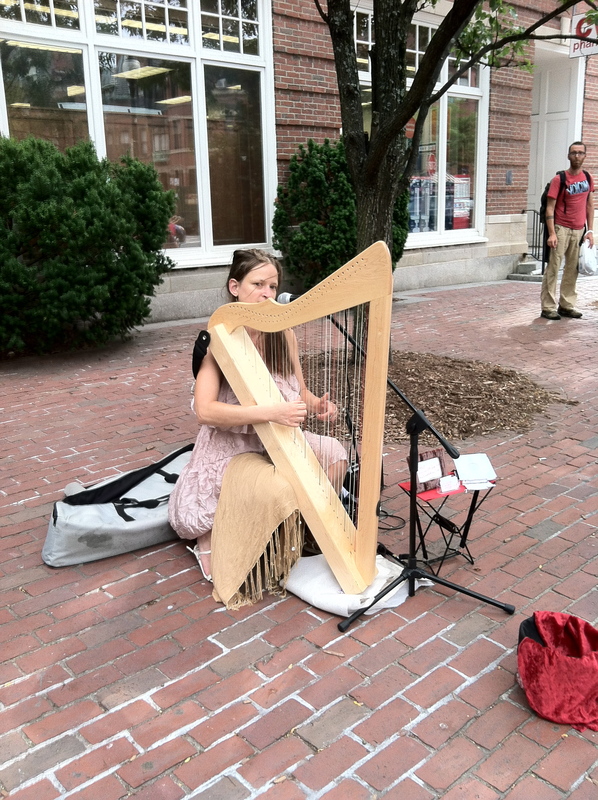 She has been busking in Boston for about three years now and started off playing prominently cover songs, such as Led Zeppelin’s Stairway to Heaven and classical songs that are common for the harp, including works by German composer Johann Pachelbel. Over time though, she slowly transitioned into doing quite a bit of improvised playing, which led to a lot of ideas flowing through her head for original songs. Eventually, fate took over again. Just over a year ago, Lucette sat in Downtown Crossing improvising a song, slowly creating an original piece of work that she could play to her listeners in the near future. As she played, words started popping into her head. Ideas started taking over. Themes of catharsis began filling her head. Sentences formed. As she continued to play, a young woman approached her to compliment her on her music. More importantly, the woman added that she felt blank spaces in Lucette’s music where lyrics belonged. Lucette agreed. Her music felt incomplete without a voice. So she added lyrics to her repertoire. For those who have heard Lucette’s voice, which sounds refined, pure and timeless, it should come as a shock that she just began singing a year ago. She has only taken a few voice lessons, and is essentially self-taught as a singer. Thematically, her lyrics are about letting go, capturing the essence of her emotions and tend to be a bit sadder. Her music has progress immensely in the T, where she taught herself how to sing and write lyrics. Everything just fell into place. We received our coffee from the barista, who may or may not have plans to busk in the future, and headed to our table to talk. Talking about all things busking with Lucette, her voice and facial expressions portrayed a certain calming quality to them. Her voice is soft and sweet, speaking very humbly of herself and her skill set, mentioning that there is always ways for her to improve. She’s a very cheery young woman who had a smile on her face practically the entire time we talked. These qualities seemed to raise more questions than answers. Why do her lyrics tend to be written about sadder topics? And where does her breathtaking singing voice come from? When Lucette began writing her own songs, she started to feel more connected to her crowd. Her lyrics are very personal and connected to her and the progress of her life and music, which she believes helps the audience connect to her in a much deeper way than if she was playing Stairway to Heaven. Since converting to her own music, she hasn’t seen a decrease. But for her, the best value of busking is not the money it offers, but instead the ability to continuously hone her craft and expand her music outside of her apartment. She needed to evolve her music into something greater, and busking has allowed her to do just that. On top of helping her evolve her music into something greater, busking has also helped Lucette realize something else pretty major: the last thing she wants to do when she gets home from a day busking in the subway is play the harp. I expressed my surprise after hearing this to which she responded, “Do businessmen go home and send more emails? No, they kick off their shoes and watch TV. So do I.” She makes a valid point. When she’s not in the subway, she typically listens to music that reaches a certain quality, as she finds focusing on that is much more interesting than putting her attention into one specific genre. While she tends to mainly listen to ambient music with calming vocals, authenticity and genuine lyrics are also important factors to her, which is why she loves Tupac. Yes, Tupac Shakur – the legendary west coast hip-hop artist. Tupac. Also in her free time, Lucette enjoys writing and contributes to her memoir from time to time. She received a degree in creative writing and is currently putting together a self-help book. As our conversation came to a close, I asked Lucette if any experiences busking in the subway really stuck out to her. Weird listeners, surprising occurrences, maybe something special that’s stuck out to her during her time in the subway. She drew a blank. She tried recalling something outstanding, but nothing came to mind. She eventually told a story about seeing a woman have a seizure on the train in the car that opened right in front of her. She dragged the woman out and when the EMTs arrived, they asked her to continue playing her harp, as the sound soothed the woman in pain. After hearing this, it became clear that her initial hesitation to answer the question was not triggered by a lack of stories to tell, but rather was caused by her trying to figure out which of the number of outlandish things that happen on a regular basis stuck out to her. I later received an email from Lucette detailing a variety of events that stood out to her. She moved to New York City with her boyfriend to busk professionally, and he carried her full size pedal harp through the streets and subways for years. She was busking in the subway once when a group of heavily armed police officers encircled her, making her nervous she had broken the law. As she continued to play, scared she was going to get kicked out, one of the officers said, “I like your harp. What kind of wood is it made of?” She played Pachelbel in Times Square once when a dance troupe overheard it and began performing their routine to it. Cheri Lucette is so much more than a little girl with a harp. 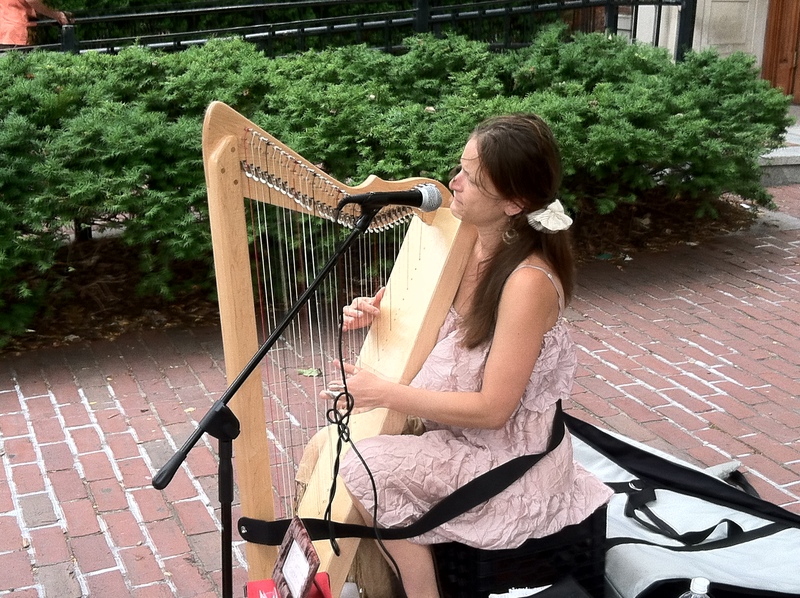 She is a fantastic musician committed to her craft that has developed amazingly during her time busking in the various MBTA stations across Boston. She illuminates these stations with music that so elegantly contrasts with the stained walls and dim lighting, and upon meeting her, it is clear that her humility resonates as loud as her self-taught singing and elegant harp playing. We should all be thankful fate took over, as it has enabled commuters to enjoy one of the most powerful and reflective musicians the T has to offer. She is available for weddings and other private events, and her personal website can be found here. You can find her upcoming shows and events here.